I've finished cleaning sand out of my bag. I've had some sleep. I've reflected on the amazing time we had. I've even watched the 4 days of coverage from the Rimini sands. Both Steve and myself worked our socks off all week. We had less sleep than anyone. During the finals we commentated on all 4 games. We were still defrosting Steve's hands an hour after we left the beach and you may notice that some of the camera work is a little shaky due to shivering. With everything considered I think we did a decent job of capturing the character and atmosphere of the event, but our opinion is not really that important. What is important is what you the viewers thought of it. Get your commenting fingers ready and bust out your feedback. Did any of it bore you? What did you want to see more of? Did you get a feel for the tournament? If you could also include in your feedback whether you were at Paganello 2008 and where you are from it would really help us. 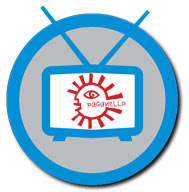 Friday will mark the release of Paga TV Episode 1, straight from the beaches of Rimini Italy! With Paganello being probably the best beach tournament in the world, this is both an intimidating venture for us as it'll be the first time we'll be knocking out episodes with only hours of editing time, AND, we'll be very susceptible to adverse weather. I've checked weather.co.uk and found that it looks like rain almost every day. Not good. Right...so all that said we're going to get some great footage regardless of the conditions of the play, the players and the scene and at the very least it can't be anything but entertaining.